People often associate music with math, but when you take a closer look at how numbers are used in music theory, you'll find out that the two subjects really have little to do with each other. While numbers on the note side of things are a little more complex, rhythm is much more straightforward; in fact, if you can count to four, you're already most of the way there. A piece of music is broken up into sections called measures (and also bars, used interchangeably) that contain that contain a specified quantity of beats, usually three or four (but it could be anything, in theory), repeated until the end of the song. Most often, the amount of beats in each measure is consistent throughout the song — if one measure contains four beats, all of them contain four beats. We call the quantity of beats per measure a "count." For example, if a song has 12 measures, and each measure has four beats in it, the song has (or, we often say, is on) a 4-count. Basically, each time you get back to one, after counting 1, 2, 3, 4, you go to the next measure. After 12 times of repeating 1 2 3 4, you're done with the song. To apply this concept on your guitar, take a C chord and play one downstroke for each beat of the 4-count: downstroke on 1, downstroke on 2, downstroke on 3 and downstroke on 4. That’s one measure. When you come back around to 1, switch to a G chord. Now you're in the second measure of the song. Songs move from measure to measure along this count, sometimes switching to a new chord, and sometimes staying on the same chord throughout the entirety of the song. Don't Freak Out About Fractions! When you're talking about counts in music, each numbered beat is called a quarter note, no matter if the count is two, three, four, or anything else. So, a measure with a count of 1 2 3 4 is equal to four quarter notes. Also note, that a measure with a count of 1 2 3 has three quarter notes. From here, we can divide each beat into two smaller beats '1 and.' This is called an eighth note because half of a quarter is an eighth. You can also note that if we split all of our four beats into eighth notes, we have eight notes: 1 and 2 and 3 and 4 and. It's important to note that a quarter-note count (1 2 3 4) and an eighth-note count (1 and 2 and 3 and 4 and)take up the same amount of space. In fact, you could think of it like the 'ands' are silent in a quarter-note count. Now, let's take it one step further and divide each of those eighth notes in half to create 16th notes. In this case, not only do the numbered beats get divided, but the ‘ands’ do as well: 1 e and a 2 e and a, 3 e and a 4 e and a. Again, 16th notes, 8th notes and quarter notes take up the same amount of space, so you could mix them up and get a count such as: 1 e and a 2 3 4 and 1 etc. Think of the 16th notes the same way as the eighth — silent between each numbered beat. While in theory, you could keep dividing into infinity, most people just get pretty fast at 16th notes, though if you ever play mandolin or drums, you'll probably have to know 32nd notes, too. Most guitar players learn an eighth note strum at the beginning and never really mess around with 16th notes. The problem with that is they miss out on a more polished sound. Logically, since we are putting more notes between beats in a 16th note strum, it’s going to sound more full, which better contrasts the natural pauses in songs. At first, working with a 16th note strum is difficult because you have to "double" your normal eighth note strum, and singing over it takes a bit of getting used to. Practice 16th notes at higher speeds, and when you’re first learning it, start each song with a few bars (measures) of the 16th note count before you start singing. You’ll find out quickly if your guitar playing is too slow — even if it seems fast — for the singing tempo, so try playing a little faster to find the correct balance. Are you Interested in Music Theory? 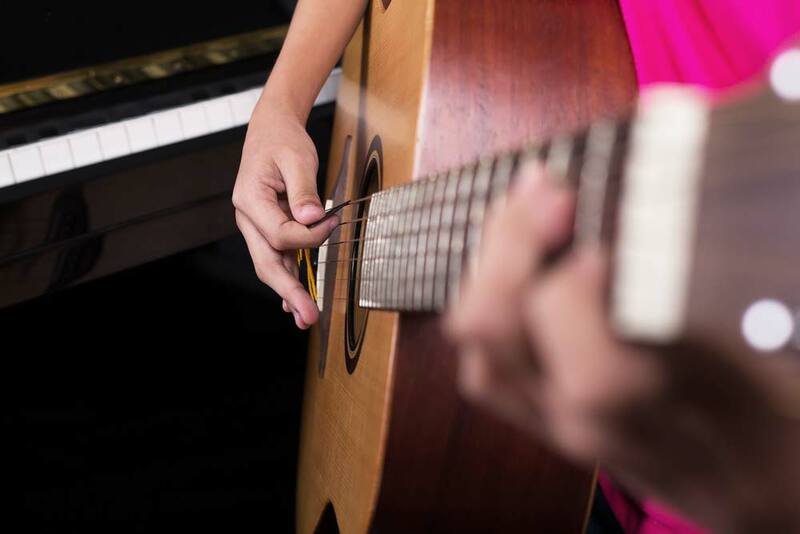 Music theory can scare a lot of players off of taking guitar lessons because it can get very confusing very quickly. The problem with learning it on your own, though, is that it often leads to more questions than answers. When you take lessons through The Approachable Music Project, we don't make any assumptions about what you understand about music theory, and can help fill any gaps that may be hindering your progress. Our studio is located in South Minneapolis and conveniently serve St. Paul students via Ford Parkway and Highway 62. Contact us for more information.